Lake Victoria or Victoria Nyanza (also known as Ukerewe and Nalubaale) is one of the African Great Lakes. It is the continent's largest lake, the largest tropical lake in the world, and the second largest freshwater lake in the world in terms of surface area. But it is most well known as the source of the longest branch of the Nile River, the White Nile. Lake Victoria plays a vital role in supporting the millions of people living around its shores, in one of the most densely populated regions on earth. Unfortunately, the introduction of invasive species (the Nile perch and the water hyancinth) and pollution on a massive scale have had a harmful effect on the lake's ecology and biodiversity, as well as the amount of fish caught. In recent years, the water level of the lake has also been dropping, a trend attributed to regional drought and increased flows for hydroelectric power in Uganda. At 26,560 square miles (68,800 sq km), Lake Victoria is the continent's largest lake, the largest tropical lake in the world, and the second largest fresh water lake in the world in terms of surface area. It is about the size of Ireland. Being relatively shallow for its size, with a maximum depth of 276 feet (84 m) and a mean depth of 131 feet (40 m), Lake Victoria ranks as the seventh largest freshwater lake by volume, containing 2,750 cubic kilometres (2.2 million acre-feet) of water. It has a water catchment area of 71,040 square miles (184,000 km²). The lake lies within an elevated plateau in the western part of Africa's Great Rift Valley and is subject to territorial administration by Tanzania, Uganda, and Kenya. The lake has a shoreline of 2,138 miles (3,440 km) and has more than three thousand islands, many of which are inhabited. 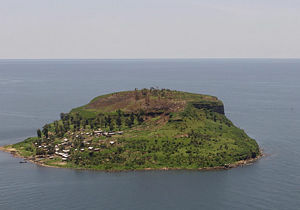 These include the Ssese Islands in Uganda, a large group of islands in the northwest area of the lake that are becoming a popular destination for tourists. Lake Victoria is approximately 255 miles (410 km) long and 155 miles (250 km) wide. It occupies a shallow depression (c. 250 ft or 75 m deep) on the Equatorial Plateau (alt. 3,725 ft/1,135 m) between two arms of the Great Rift Valley. It has an irregular shoreline and many small islands. 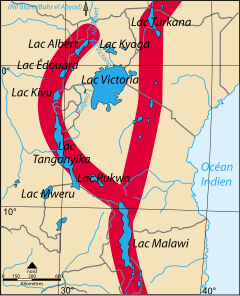 Numerous streams, including the Kagera River, feed Lake Victoria. Lake Victoria is relatively young; its current basin formed only 400,000 years ago, when westward-flowing rivers were dammed by an upthrown crustal block. The lake's shallowness, limited river inflow, and large surface area relative to its volume make it vulnerable to climate changes; cores taken from its bottom show that Lake Victoria has dried up completely three times since it formed. 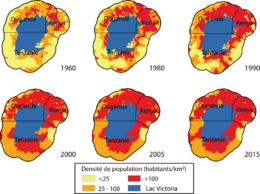 These drying cycles are probably related to past ice ages, which are times when precipitation declined globally. The lake last dried out 17,300 years ago, and filled again beginning 14,700 years ago; the fantastic adaptive radiation of its native cichlids has taken place in the short period of time since then. The lake as seen from space, looking west, with other members of the African Great Lakes forming an arc in the middle distance. The cloud-covered forests of the Congo can be made out in the distance. Formed during the upheavals that created the Great Rift Valley 12 million years ago, the African Great Lakes were affected by the ice age of 18,000 years ago. The increased aridity caused Lake Victoria to dry up completely. Then, around 13,000 years ago, the climate changed and heavy rains filled the dry lakebed, sending rushing waters into the upper Nile. The first recorded information about Lake Victoria comes from Arab traders plying the inland routes in search of gold, ivory, other precious commodities, and slaves. An excellent map known as the Al Adrisi map, dated from the 1160s C.E., clearly depicts an accurate representation of Lake Victoria and describes it as being the source of the Nile River. 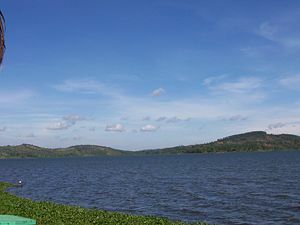 The lake was first sighted by Europeans in 1858 when the British explorer John Hanning Speke reached its southern shore while on his journey with Richard Francis Burton to explore Central Africa. Believing he had found the source of the Nile on seeing this vast expanse of open water for the first time, Speke named the lake after the then Queen of the United Kingdom. Burton, who had been recovering from illness at the time and was resting farther south on the shores of Lake Tanganyika, was outraged that Speke claimed to have proved that his discovery was the true source of the Nile, which Burton regarded as still unsettled. A public quarrel ensued, which not only sparked a great deal of intense debate within the scientific community of the day but much interest by other explorers keen to either confirm or refute Speke's discovery. The well-known British explorer and missionary David Livingstone failed in his attempt to verify Speke's discovery, instead pushing too far west and entering the Congo River system. It was ultimately Henry Morton Stanley who confirmed the truth of Speke's discovery, circumnavigating the lake and reporting the great outflow at Ripon Falls on its northern shore. Together they make the lake of great socio-economic importance to the region. The fishery resources from the lake are a major source of revenue to governments and a source of employment, which supports livelihoods for 3 million persons who are directly involved in the fishery industry. It is estimated that the annual fish catch from Lake Victoria is about 750,000 metric tons, generating more than US$400 million per year, of which US$250 million lies in exports. Lake Victoria is also an inland water transport linkage for the three East African states. Furthermore, the lake is a major reservoir and source of water for domestic, industrial, and commercial purposes. The cities of Mwanza, Kampala, and Kisumu, as well as several major towns and urban centers within the basin with a total population of nearly 5 million, receive their water supply directly from the lake. Besides the cities and urban centers, several rural villages get their water supply from the lake and rivers within the basin. Lake Victoria and the rivers flowing into it form a major reservoir for hydroelectric power. In Uganda, power generation capacity is 320 MW generated at Nalubaale and Kiira dams. Farther downstream there is a potential for power generation at Bujagali (250 MW), Karuma (100 to 200 MW), and Kalagala (450 MW). In Kenya there is a potential to generate a total of 278 MW of electricity from the Sondu-Miriu, Kuja, Nzoia and Yala rivers. The lake has other added values, such as climate modulation in the region and richness in biodiversity. Currently it is experiencing severe threats that are contributing to losses amounting to millions of dollars annually. Key among the threats is declining water levels and prolonged droughts in the entire basin. As a result of this, for example, ships cannot dock at the quays in most of the ports; electricity production at Jinja has declined; and the intakes of the water treatment plants in Kisumu, Entebbe, Mwanza, and other riparian towns have been severely affected, resulting in a decrease in the amount of water supply. Since the 1900s Lake Victoria ferries have been an important means of transport between Uganda, Tanzania, and Kenya. The main ports on the lake are Kisumu, Mwanza, Bukoba, Entebbe, Port Bell, and Jinja. The steamer MV Bukoba sank in the lake on October 3, 1995, killing nearly a thousand people in one of Africa's worst maritime disasters. The ecosystem of Lake Victoria and its surroundings has been badly affected by human influence. In 1954, the Nile perch (Lates niloticus) were first introduced into the lake's ecosystem in an attempt to improve fishery yields of the lake. Introduction efforts intensified during the very early 1960s. The species was present in small numbers until the early to mid 1980s, when it underwent a massive population expansion and came to dominate the fish community and ecology of the world's largest tropical lake. Also introduced was Nile tilapia (Oreochromis niloticus), now an important food fish for local consumption. The Nile perch proved ecologically and socioeconomically devastating. Together with pollution born of deforestation and overpopulation (of both people and domestic animals), the Nile perch has brought about a massive transformation in the lake ecosystem and to the disappearance of hundreds of endemic cichlid species. Many of these are now presumed to be extinct in the wild, though populations of some of them are being maintained in North American zoos and aquariums. Also vanished from Lake Victoria is one of two native species of tilapia (another kind of cichlid fish), known as the ngege. The ngege is superior in taste and texture to Nile tilapia, but it does not grow as fast or as large and produces fewer young. The initial good returns on Nile perch catches, at their peak delivering export revenues of several hundred million dollars a year, have diminished dramatically due to poor enforcement of fisheries regulations. The proceeds from Nile perch sales remain an important economic engine in the region, but the resulting wealth is very poorly distributed and the overall balance sheet on the Nile perch introduction to Lake Victoria is well into the red despite the enormous value of the perch as an export commodity. The three countries bordering Lake Victoria—Uganda, Kenya, and Tanzania—have agreed in principle to the idea of a tax on Nile perch exports, with the proceeds being used for various measures to benefit local communities and sustain the fishery. However, this tax has not been put into force, enforcement of fisheries and environmental laws generally is lax, and the Nile perch fishery remains in essence a mining operation. Currently, the Nile perch is being overfished. Populations of a few endemic cichlid species have increased again, particularly two or three species of zooplankton-eating, herring-like cichlids (Yssichromis) that school with an abundant native minnow known locally as dagaa (Tanzania), omena (Kenya), or mukene (Uganda). The fight against the huge increase of water hyacinth ('Eichhornia crassipes'), a native of the tropical Americas that forms thick mats, has had a happier outcome. The mats created by the spread of the plant caused difficulties to transportation, fishing, hydroelectric power generation and drinking water supply. By 1995, 90 percent of the Ugandan coastline was covered by the plant. With mechanical and chemical control of the problem seeming unlikely, the mottled water hyacinth weevil (Neochetina eichhorniae) was bred and released with very good results so far. The only outflow for Lake Victoria is at Jinja, Uganda, where it forms the Victoria Nile. The water originally drained over a natural rock weir. In 1952, British colonial engineers blasted out the weir and reservoir. A standard for mimicking the old rate of outflow called the "agreed curve" was established, setting the maximum flow rate at a rate that varied depending on the lake's water level. In 2002, Uganda completed a second hydroelectric complex in the area, with World Bank assistance. By 2006, the water levels in Lake Victoria had reached an 80-year low. Daniel Kull, a hydrologist with the United Nations International Strategy for Disaster Reduction in Nairobi, Kenya, calculated that Uganda was releasing about twice as much water as allowed under the agreement and was the primary culprit in recent drops in the lake's level. According to him, the water level is nearly half a meter lower than what it should be. 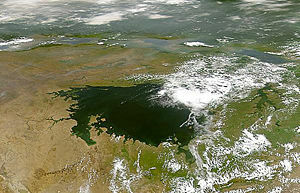 Decreasing levels of Lake Victoria Worry East African Countries UGPulse.com. Uganda pulls plug on Lake Victoria New Scientist. Lake Victoria: a sick giant Cichlid-Forum.com. This page was last modified on 20 June 2018, at 14:45.